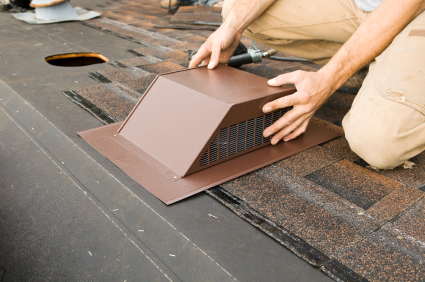 Proper attic ventilation is one of the most important parts of the roof. Attic ventilation extends the life of your roof and reduces problems because it minimizes the temperature differential between the attic and the air outside. If you have proper ventilation it will remove heat and moisture from the attic. The trapped heat and moisture will raise energy costs and will damage the roof systems in your home. It will also damage the structural support parts of the roof and your personal items inside the attic where temperatures can easily reach 160° F . The condensation that forms inside the attic can be caused by different things such as showers, tumble driers, washing machines and more. All of these items need to be properly vented through the roof. One of the most important things, the roofing system itself will deteriorate prematurely because of bad ventilation. Sumps between rafters can happen because after a while a plywood roof deck can warp or deteriorate and become spongy and dangerous to walk on. This happens because one side of plywood decking needs be able to “breathe” by being exposed to circulating air. The adhesives used in the plywood can deteriorate because of the condensation. Mildew is another problem. It is both damaging for the roof and can cause health problems. Water vapor will condense first on anything made of metal inside the attic; this will eventually cause the metal to rust. Heads can rust off nails, metal plumbing straps or straps holding HVAC ducting can rust in two causing the ducting to crash down on top of the ceiling joists or through a suspended ceiling. This problem is more common in humid climates. Insulation can trap moisture which will reduce the R-value of the insulation and will create a nice environment for the propagation of certain molds, spores, and fungi. Cooling units will need to be serviced or replaced prematurely because of the excessive use. Ice Dams – The right ventilation used in conjunction with insulation and an air barrier can create a Cold Roof Assembly which will help eliminate ice dams. Ice dams are caused by melting snow continually refreezing at the roof perimeter and then backing up under the shingles and causing leaks.